/ Confirmation of the Covenant: Who are “He” and “the Many”? Which Christ confirms the covenant in Daniel 9:27 for seven years, Jesus or Antichrist? And who is this covenant made with that is only described as "the many?" Is it the Jews or someone else? Tim: My question is in regard to the word "many". I used my concordance with not much luck. I noted that you had written down in your book, the meaning of the word HaRabim translated "the many". Where do I find the Hebrew meaning for many? Where did you come up with HaRabim? I was in a very large bible study class last evening. We have been studying Daniel and at this point it was on Daniel 9. I was fine until we got to the word many and our Bible Study teacher indicated it was Jews. I raised the question as to why it was a covenant only with the Jews as the word stated many. Our teacher stated it was written to the Jews so therefore the many were the Jews. HELP ME!!!!!!!!!!!!!!!!!!!!!!! We use the precept method which is asking who,what, why, where, when, how etc., Many would mean to me people other than Israel/Jews or whatever. A group or many nations. I hope you can help me out. I love your articles and books. Keep up the good work. The question is, who is the "he?" The traditional view of this passage is that "he" here refers to the Antichrist. The Antichrist will confirm a covenant and stop sacrifices that at some point a future will resume, and set up the Abomination of Desolation. Preterists say that he refers to the real Christ; Jesus Christ is actually the one that causes sacrifices to stop by sacrificing himself. As far as the overspreading of abominations I don't know how they explain that. So how do we know who the he is? We can know for sure who he is. The he of Daniel 9:27 does three things: he first confirms the covenant, he stops the daily sacrifices, and he sets up the Abomination of Desolation. In Daniel 11 we have a discourse about the King of the North. When you get to verse 31, it talks about the Antichrist and his partners placing a abomination that makes desolate and stopping the sacrifices. This is absolute proof that the he of Daniel 9:27 is the Antichrist not the real Christ. Daniel 11:31 (KJV) And arms shall stand on his part, and they shall pollute the sanctuary of strength, and shall take away the daily sacrifice, and they shall place the abomination that maketh desolate. Daniel 11:36 (KJV) And the king shall do according to his will; and he shall exalt himself, and magnify himself above every god, and shall speak marvellous things against the God of gods, and shall prosper till the indignation be accomplished: for that that is determined shall be done. Is that Jesus Christ speaking against the God of gods? Obviously not. It's the Antichrist exalting himself above all that is called God. The apostle Paul referred to the same thing. In 2nd Thessalonians 2:3-4 the apostle Paul said that day shall not come, speaking of the second coming, until there comes a rebellion first and that Man of Sin is revealed, the Son of Perdition, who exalts himself above all that is called God of that is worshiped and sits in the Temple of God claiming to be God. So both of these phrases talking about the Antichrist talk about him exalting himself above God and claiming to be God. Daniel 9:27 is speaking about the Antichrist which is also the reason that Preterism is a false doctrine and should not be believed. The timing of the Confirmation of the Covenant is another issue that I have researched with great success. 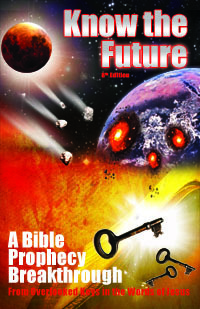 Certain things Jesus said that most Christians overlook unlock even the very day that this event will happen, as well as the day of the rapture. See this long study for the two overlooked statements of Jesus revealing the Book of Revelation's Timeline. Who Are "The Many" (HaRabim)? I believe the book of Revelation that came later showed us the rest of the story on that Antichrist covenant. Rev 17 talks about the Beast (AC) having a covenant with ten rulers who don't have a kingdom but have the power to make him king and then receive rulership with him. HaRabim can also be translated "the great" which is what Rav (rabbi) is connoted to mean when Jews call their teachers rabbi (my great one). The Ten Rulers are indeed great ones to have power over the earth and make him supreme, not Jewish ones. I lean more to a post trib rapture because it says in REV 6-11 about the opening of the fifth seal and them that were slain for the word of God so to me obviously christians are still here on earth and another thing what would be the point of the mark of the beast and persecution if all of the believers were raptured then you wouldn,t have no one to force or causeth if you will to take the mark. REV 3,10 also talks about the tribulation we will have to go through but if we are faithful even unto death God will give us a crown of life.